Indigenous Fijian cultural history before European contact is little known, but the social order that existed provided for rich diverse cultural experience, even though violence and incessant warfare were common. Before the acceptance of the Wesley Mission by the Bauan chief, Ratu Seru Cakobau, indigenous Fijian tribes fought bloody battles and engaged in cannibal feasts as documented by colonial historian R. A. Derrick (1950). However, following contact with Europeans and the introduction of firearms, the chiefdom of Bau, in eastern Fiji, emerged as a hegemonic political power in eastern Fiji. Europeans exploited indigenous resources for profit and formed alliances with various indigenous chiefs who mobilized commoners to harvest sandalwood and beche-de-mer, which were priced commodities overseas. With increased trade came demands for a stable government. However, divergent interests of chiefs and Europeans led to conflict and the eventual demise of the Cakobau government, established in 1871 by settlers to increase trade and investment in the Fiji islands. Fearing political instability and further conflict between Europeans and indigenous Fijians, the chiefs of Fiji ceded Fiji to Britain, which implemented a paternalistic indigenous policy based on the cultural experience of Bau. Not long after cession to Britain, conflict between the chiefs and the Europeans re-surfaced. Indigenous chiefs expressed concern over alienation of indigenous land, and as a result, the Native Land Ordinance was passed. Under the leadership of Governor Arthur Gordon, indigenous Fijian land rights were strengthened, and a new cultural group in the form of Indian indentured laborers was introduced. While Governor Gordon wanted to shield indigenous Fijians from the devastating effects of plantation labor, he had introduced to Fiji Indians who were politically active and after indenture in 1920 demanded political equality. Indigenous Fijian chiefs were concerned with the introduction of Indian laborers as successive governors, after Gordon, heightened fear among chiefs with calls for changing land legislations and introducing indigenous Fijians to plantation labor and commerce. In the end, the indigenous chiefs prevailed following the affirmation of Gordon’s policies by the colonial authorities in the form of humanitarian governance (Lester and Dussart 2014). This article aims to trace the history of indigenous Fijians from pre-cession Fiji and in particular addresses the issue of colonial constitution on ethnicity which was established by largely the European conceptualization and understanding of indigenous Fijian culture and tradition. More importantly, there were competing ethnic social forces and political alliances in pre-cession and post-cession Fiji that influenced transition to self-rule. The most complex form of socio-organisational confederation is found in the eastern parts of Fiji, especially in areas which have come into close contact with influences and ideologies originating from outside Fiji, particularly those of monarchical or near-monarchical Tonga and perhaps also the highly stratified and status-differentiating Samoa. In fact, in eastern Fiji, the war chiefs of Kubuna became paramount authority on matanitu as the eastern chiefs of Fiji became political power brokers in the first half of the nineteenth century and used their customary influences to position themselves strategically with collaborative partnership with Europeans. There were special rules regarding chiefs, and these were enforced with extreme prejudice, and as colonial historian R. A. Derrick (1950: 16) observed: “no person might reach for an object above the chief’s head without first asking for and obtaining permission.” Failure to adhere to customary laws meant punitive punishment including death, and the chiefs usually imposed their law with the assistance of the priests and warriors. In pre-cession Fiji warfare, rivalry among indigenous tribes was also widespread. Indigenous women from outside the tribe were aggressively sought by indigenous chiefs, and as a result abduction of women was commonplace. Besides competition for women, indigenous chiefs actively extended their tributary through violent invasions and subjugation of conquered territories. While endless feuding was a permanent character of pre-cession Fiji, there nevertheless existed an interdependent relationship among indigenous chiefs, village priests, warriors, and commoners. However, contact with the Polynesian Tonga modified the pre-cession Fijian social order and influenced the rise of the indigenous polity of Bau. The Tongans had a long relationship with eastern Fijians. There were established movements of people, ideas, and objects between Tonga and Fiji. As a result of trade and movement of a large number of people, by 1840 a number of Tongans reside in Fiji. Some of them were living as craftsmen or traders or mercenaries in Fijian villages and some in colonies of their own (Oliver 1989: 1151). The long and extensive contact with Tonga produced a hierarchical political organization in the eastern parts of the Fiji Islands, including Bau, Lau, Bua, Macuata, Cakaudrove, Lakeba, and Moala. In eastern Fiji, a Polynesian form of hierarchical social structure existed long before European contact. Shelley Ann Sayes explains the political hierarchy in Cakaudrove. R. A. Derrick notes that every stick of sandalwood had blood upon it. He argued that “chief fought with chief in laying claim to patches of trees that had suddenly become valuable. They drove their people to cut logs, quarrelling over the spoils” (Derrick 1950: 43). However, David Routledge (1985: 44) claimed that the sandalwood trade involved limited contact between indigenous Fijians and Europeans. His position was supported by Peter France, who argued that “the effect of this trade on the lives of indigenous Fijians was limited to the provision of iron tools and glass beads for the common people and to military assistance for the chiefs of a small area on the west coast of Vanua Levu” (France 1969: 25). The introduction of guns and iron tools radically altered the indigenous Fijian social structure. Traditional weapons such as spears, arrows, and clubs became ineffective in warfare, and after the 1830s, with increased trade, possession of a musket became an essential requisite of a properly equipped indigenous Fijian warrior. Firearms also played a significant role in the emergence of Bau as a hegemonic polity in eastern Fiji since it was first to obtain muskets with the assistance of a European sharpshooter, Charles Savage. The structural power of Bau soon superseded that of its rivals, and its hegemonic position was established through militarization. Moreover, the leadership of the kingdom was taken up by young chief, Ratu Seru Cakobau, who played an important role in forming strategic alliances with rival chiefs and Europeans. According to R. A. Derrick (1950: 117) “Cakobau lived the best years of his life through a violent period of bloodshed and cannibalism and he took a leading part in all its horrors.” After accepting Christianity in 1854, Cakobau formed alliances with European traders, missionaries, rival chiefs, and mercenaries and became the upholder of privilege and the exploiter of ancient indigenous custom. However, there were commercial forces operating in Fiji that were beyond the control of Ratu Cakobau. European contact made Fiji part of the global political economy of the nineteenth century. In less than 10 years, all sandalwood stands were logged from Fiji. Afterward, European traders found a new marketable commodity called beche-de-mer. Beche-de-mer or dried flesh of the sea cucumbers was highly valued in China. According to R. Gerard Ward (1972), “the rise in beche-de-mer trade in Polynesia and Melanesia was closely linked with that of sandalwood, often providing an alternative income to traders faced with the depletion of the sandalwood resource.” The beche-de-mer trade demanded that the islanders learn new tasks and sometimes undertake labor under European direction. The beche-de-mer lasted a little longer than the sandalwood trade (1822–1850), and during this period, traders and beachcombers started to settle on the islands. With growing European interest in Fiji’s natural resources, information soon reached imperial centers of the world on potentials for economic investment and Christian missions. The introduction of Christianity transformed old Fiji by outlawing ancient practices such as cannibalism and widow strangulation which were widespread. On 12 October 1835, the first members of the Wesleyan Methodist Missionary Society arrived in Fiji in the persons of Reverend William Cross and Reverend David Cargill (Clammer 1976: 9). Cross and Cargill realized that the conversion of chiefs to Christianity was a prerequisite for mass conversions of indigenous Fijians. The momentum to covert the indigenous population expanded in 1838 after John Hunt, James Calvert, and Thomas Jagger brought to the island a printing press and published the Bible. The missionaries and their agents utilized existing knowledge of the Tongan language to publish the Bible in the native text, and through the religious teachings of Jesus Christ, indigenous Fijians were encouraged to abandon past heathen and pagan customary practices. The missionaries were agents of various imperial interests, and their presence on the island of Fiji was aimed at changing the customs of land (France 1969: 29). However, not only customary practices were being overhauled, but ethnic identity of indigenous Fijians was also getting transformed. By attacking the gods of indigenous Fijians, the Christian missionaries restructured the power of the indigenous chiefs. An indigenous Fijian chief derived spiritual power from the ancestral gods, and by discrediting their belief, Christian teachings reduced the old custom and ushered in a more rigid form of ethnic hierarchy (France 1969: 30). However, Christianity was not accepted with open arms by some indigenous Fijians, and for a while, there was fierce warfare between converts and holdouts. The issue of religion, nevertheless, was settled in 1854 when chief Cakobau acceded to a request of the King of Tonga and accepted the Wesleyan Mission (Oliver 1989: 197). By the mid-nineteenth century, the indigenous Fijian traditional social order was successfully transformed by European contact and more importantly by Australian migration (Young 1984). In particular, an influx of Europeans created new inter-ethnic tensions as Europeans established settlements on indigenous land provided for by the chiefs (Tippett 1955: 212–219). However, the new European-inspired social arrangement rested on a fragile socioeconomic arrangement. There were sporadic attacks on European property, and in one such incident, outrages were committed against an American citizen, who filed a legal suit against the indigenous chiefs of Fiji. European settlers wanted to establish a functioning government to ensure security of European property and investment in the islands. The Europeans manipulated the hegemonic position of Bau and installed Ratu Seru Cakobau as “Tui Viti” or the King of Fiji (Lawson 1991: 48). The move by the Europeans established defacto rule of Bau over all the islands of Fiji, even though there were growing resentment to eastern Fiji from various tribes of western Viti Levu. Moreover, the Europeans were positioning themselves for a more labor-intensive investment in cotton, copra, and potentially sugar. By the 1860s, the beche-de-mer trade had dropped off significantly, and other export commodities, like coffee and cocoa, were introduced by European settlers. A short-lived cotton boom occurred when world cotton shortage, caused by the American Civil War (1861–1865), prompted many would-be planters to the island, thereby increasing the stake in land and local politics (Oliver 1989: 198). The cotton boom was short, but within this period, there was a surge in migration, and in 1871, Europeans settlers convinced Cakobau to establish a functioning government. Not least among Europeans motivation was the need for political stability, security, and possession of indigenous land. However, factions and divisions emerged between the European community and the chiefs, resulting in the demise of the Cakobau government (France 1969: 92). The initiative to establish a government enabled European settlers to form political and economic alliances with indigenous chiefs of eastern Fiji. Most significant ally of the Europeans was Cakobau, who was keen on consolidating his authority on all parts of Fiji. In 1873, using the killing of a settler community as an excuse, the Cakobau government launched an invasion against the defiant Hill Tribes of interior Viti Levu (Howard 1991: 23). After defeating the rebels, Cakobau expropriated their land and sold it to the Europeans. The subjugation of the Hill Tribes had a profound impact on the western part of the main island of Viti Levu, where indigenous Fijians carried out attacks against Christian missions and Europeans generally. Despite the initial subjugation of the rebellious tribes of interior Viti Levu, the Cakobau government failed to provide order and good governance required by the growing European community. As a result, with the assistance of indigenous chiefs, representations were made to a number of imperial powers for the cession of the islands. After initially rejecting the offer, Britain reconsidered its position following reports that British nationals were involved in labor traffic in the Pacific Islands. Concern about the abuse of Pacific Islanders by commercially minded Europeans was one of the reasons for Fiji’s cession. Britain understood Fiji primarily from the interpretations provided by the chiefs of eastern Fiji, where Bauan influence had led to cultural and social synchronization across the tribes in the region. More importantly, the cession of Fiji to Britain strengthened the cultural hegemony of Bau. On 10 October 1874, the chiefs of eastern Fiji Vunivalu Cakobau, Maafu, Ratu Epeli, Tui Bua, Savenaca, Esekeli, Tui Dreketi, Ritova, Katonivere, Ratu Kini, Matanitobua, and Nacagilevu ceded Fiji to Britain. The cession was inevitable, because the Cakobau government (1871–1874) was virtually bankrupt and the European population wanted a stable political authority to protect their economic interests. The provisional governor of Fiji, Sir Hercules Robinson, inherited the task of administering Fijians. Borrowing from the political and social organizations of the Bauan chiefdom, he grouped the islands of the colony into provinces, based on boundaries of the old state, and within the province, a number of divisions were created, each compromising a group of villages related by kinship. Each of these administrative units – the village, the district, and the province – was placed in charge of a Fijian, and there was a chain of responsibility from the lowest level to the highest (Roth 1953: 135). The British colonial government brought to the island the concept of “humanitarian colonialism which was crystallised out of the complex assemblages and networks of the newly expended empire” (Lester and Dussart 2014: 23). The concept of humanitarian colonialism emerged from colonial governance, which continued to consider itself humane. Hence the protectionist project in Fiji initiated a new era in colonial history where ethnicity was established using three forms of categorization: white settlers, indigenous Fijian, and later Indian indentured workers. White settler community and the British colonial administration were the white elite, indigenous Fijians were labeled “exogenous others” who resided within the boundaries of the colonial entity, conveniently excluded from exercising any political authority (Veracini 2011: 26–27) and the “abject others,” notably Indian indentured laborers who were permanently excluded via rigid ethnic boundaries and political control. It is within this humanitarian colonialism and ethnic boundaries the British colonial authorities restructured the indigenous administrative system by giving exclusive jurisdiction on indigenous affairs to the Council of Chiefs, Boselevu Vakaturaga, which was a new institution, based on the collective political experience of the chiefs in the pre-Cession Cakobau Government. Despite dominated by the chiefs from the eastern Fiji, the Council became the official custodian of indigenous land, culture, tradition, customary rights, and social relations. Besides, the Council helped entrench British indirect rule by ensuring acceptance of the imperial rule by indigenous Fijians. The colonial and the indigenous Fijian customary administrations were “networked associations” that “decentered both white and indigenous agency” (Lester and Dussart 2014: 32). The decentered element was the distance between the political hegemony of the colonial administration and the indigenous Fijian administration (Norton 2013: 409–428). The Council of Chiefs played an important role in steering the colonial policy on indigenous land where the governor consulted indigenous chiefs on the status of indigenous land while reserving the right to make decision on all land alienation. The Deed of Cession of 1874 was interpreted in a way that created the popular myth of a protective or humanitarian colonial policy toward the natives. According to Macnaught, “in the Fijian popular mind the lands had been given by the chiefs to the Queen Vakaturaga, that is, by way of a chiefly presentation which entitled them to expect that the Queen in her reciprocal generosity would return the lands to be shared and used by the people” (Macnaught 1982: 30). The first governor to Fiji, Sir Arthur Hamilton Gordon, cemented a protective and humanitarian colonial policy by establishing and strengthening the Council of Chiefs and the associated Fijian administration, modeled around the customary experience of eastern Fiji and the logic of colonial constitution where the Europeans established political hegemony and indigenous population established their own zones of social transcourse within the colonial socioeconomic system. Gordon was a conservative at heart and campaigned against self-government in the North American Colony of New Brunswick. However, his apparent lack of success in North America left him bitter and disillusioned with London. Nevertheless, he was very well read and had intimate knowledge of the cultural destruction of the indigenous peoples of North America, West Indies, and Australia (Lemarchana 2011). As a convert to preserving indigenous way of life, Gordon was determined to safeguard indigenous Fijian culture. But according to historian Peter France, Gordon’s understanding of indigenous Fijian affairs was fundamentally flawed. According to him: “to begin with, Gordon did not speak or write indigenous Fijian and was further estranged by his adoption of the position of a high chief” (France 1969: 104–105). A lack of indigenous languages greatly affected Gordon’s ability to comprehend the nuances of indigenous Fijian culture and customary practices. As a result, he relied excessively on interpretations from more nuanced white settlers and their political agents in the colonial administration. Gordon claimed that the provincial, district, and village indigenous social systems were firmly established in indigenous Fijian tradition. However, this was not the case for all of Fiji. In western Viti Levu, a different form of social organization and hierarchies existed (Brewster 1922). Nevertheless, Gordon saw Roko Tui (the Provincial chief), Buli (District Chief), and Turanga-ni-koro (the village head) working well with the colonial administration, and as a result, a Fijian administration was informally established. Indigenous Fijian labor was regulated through a paternalistic tax policy, where male indigenous Fijian between the ages of 16 and 60 contributed 20 days labor on public works in the province, including road works, improving provincial offices, hospitals, and gardens. Gordon believed that in such a policy, Fijians would have minimum impact in the indigenous way of life and would preserve the communal mode of production of indigenous Fijians. Besides a paternalistic tax policy, the Deed of Cession allowed the chiefs, together with the colonial government, to oversee the utilization and the alienation of indigenous land. European settlers in Fiji wanted to acquire indigenous land for commercial agriculture and even before cession taken indigenous land through deception. As a result, the Council of Chiefs was reluctant to alienate any indigenous land. However, by the virtue of the Deed, the colonial government had exclusive legal jurisdiction on the economic development of the Colony, and as such, Sir Arthur Gordon decided to develop the sugar industry in the colony by importing Indian indentured laborers from 1879 to 1916 (Lal 1980: 52–70). It is important to note at this point that Gordon saw coercing indigenous Fijians and bringing them into the colonial plantation economy as an abomination that would ultimately lead to the demise of the native and as Bruce Knaplund observed, Gladstone at the Colonial Secretary Office noted the following: “I think your spirit and feeling towards the natives (in Fiji) is an honour for the empire” (Knaplund 1958: 296), and keeping with the spirit of humanitarian influences in colonial policy, “Gordon sought a stabilising factor between the welfare and prosperity of the Fijians and the commercial success of the white settlers and found it in the introduction of Indian labourers” (Cumpston 1956: 371). In introducing Indians to the Colony of Fiji, Gordon had introduced a third ethnic group, which had different customary practices to indigenous Fijians and Europeans. The colonial administration controlled the political affairs of the state in collaboration with the white settlers, and indigenous Fijian chiefs provided advice to the governor through the Council of Chiefs and ensured that the Fijian administration in place functioned without much disruption. Indian indentured laborers, however, were permanently excluded from any form of political representation. According to Loretta de Plevitz (2010: 181), Indian laborers “were treated worse than African slaves,” but more importantly Gordon was more concerned with “settling tribal disputes” which was a hangover from the problems that emanated from the initial European contact. Nevertheless, the colonial administration had formed an opinion on the pathway for the sugar industry in the Colony of Fiji which required abundant supply of Indian labor. However, this labor was not cheap, and Gordon’s insistence on preserving indigenous way of life caused frictions. In the end, Gordon got what he wanted as coolie ships continued to come to Fiji with able bodied men and women, considered ready for sugar plantation. The establishment of the sugar industry led to further alienation and pressure on indigenous land, resulting in intervention from indigenous chiefs and the colonial administration and the enactment of the Native Land Ordinances. While Indian labour proved quite successful in developing and extending a viable sugar economy, indentured labours started agitating for better wages and working conditions. For the colonial government, Indian labor provided indigenous Fijians the time needed to absorb the impact of colonial rule, arrested the steady decline in their numbers, and enabled the indigenous community to enjoy the unusual institutions that had given them a powerful voice in colonial policy (Macnaught 1982: 2). However, after the end of indenture, Indians in Fiji demanded political equality and embarked on a series of anti-colonial campaigns, which caused concern among indigenous Fijian chiefs and the colonial administration. Realizing that there was a militant ethnic group in the colony, successive governors, after Gordon, attempted without success to introduce indigenous Fijians to commerce and open up indigenous land. The failures it seems emanated from the colonial structure and in particular from the policy of humanitarian colonialism that laid the foundation for protection of indigenous culture and tradition. Demands for air tight protection of native land from the Council of Chiefs in particular led to frictions as new constitution on ethnic governance in the Colony was put into operation. This form of unwritten constitution on ethnicity evolved after the arrival of Indian indentured workers in 1879 and shaped considerably during post-World War II and further matured just before independence. Following the end of tenure of Governor Gordon in 1880, successive governors largely continued with Gordon’s policy. However at the beginning of the twentieth century, governors in Fiji Everard im Thurn and George O’ Brien defined indigenous Fijian political autonomy as the governing of the natives through the chiefs and for the chiefs. Governor im Thurn argued that Gordon’s interpretation of the Deed of the Cession was a conspiracy to defraud the crown of its legitimate assets: indigenous Fijian land and labor. He reviewed the history of indigenous Fijian land transaction as “one great blunder from the beginning” and emphasized that land boundaries shifted due to tribal conflict in pre-cession Fiji and that determining land boundaries with any degree of accuracy was not possible in the Colony of Fiji (Knapman 1992: 32). Everard im Thurn wanted to release indigenous Fijians from the “iron” customs which, according to the governor, prevented them from participating fully in the colonial economy. However, the ideas of Governors O’Brien and im Thurn were dismissed by the colonial secretary in Great Britain, following intense lobby from members of the Council of Chiefs. The colonial head office reiterated its support for the humanitarian policy toward indigenous Fijians and supported managing competing ethnic interests through greater collaboration between the Council of Chiefs and the colonial administration. The Chief-Gordon viewpoint found even wider acceptance among indigenous Fijians with the increase in Indian population after the end of indenture in 1920. It was argued by the chiefs that indigenous Fijians not only needed protection from the demands of the colonial economy but from Indians as well. Village leaders, Turaga ni koros, were informed by the authorities to keep an eye on any Indians attempting to settle in indigenous villages. Upon discovery of such an activity, Indians were to be promptly arrested and brought back to the labor barracks. William Sutherland notes that the ideology and the practice of racialism perpetrated by the ruling class made a large section of the indigenous Fijian population see themselves primarily as Fijians rather than exploited people (Sutherland 1992: 32). By the mid-twentieth century, the Chief-Gordon viewpoint was firmly in place, and the segregation of the three communities within their respective cultural and ethnic blocs was largely complete. One of the most avid defender of the colonial government and the Council of Chiefs was Ratu Sukuna, the first indigenous Fijian chief to receive western education. Sukuna was the district commissioner of Lau and a son of a Bauan chief. As the most gifted of the young indigenous chiefs, he was selected to be educated in New Zealand and England. Ratu Sukuna was concerned about the pressure from Europeans and Indians to open up indigenous land for commercial agriculture, and as a result, he played a major role in the establishing the Native Land Trust Board (NLTB) in the 1940s. The Native Land Trust Ordinance of 1940 was formulated to protect the interests of indigenous Fijian landowners by legalizing indigenous land rights. The objectives of the Ordinance were to protect indigenous interest in their own soil, preserve an area ample for their needs in the future, make provision for suitable and sufficient land for settlement by others, and achieve a continuity of policy and security of leaseholders (Wesley-Coulter 1967: 52). However, as Timothy J. Macnaught (1974: 19) observed: “Ratu Sukuna and the architects of the revitalised Fijian Administration after 1944 felt that the prerequisite of modernisation was to amalgamate the old tikina into more efficient units. The policy failed: the strengths of the old system were undermined; the communities resented their loss of autonomy, and rule by civil servants was considered intolerable.” The theme of modernization was also picked up by indigenous Fijian anthropologist Rusiate Nayacakalou (1975) who saw Sukuna’s Fijian Administration as an interim solution pending modernization of indigenous Fijian society. However, Nayacakalou emphasized that there was anxiety among the indigenous population due to increasing number of Indian population in the Colony of Fiji. Spate emphasized the whole establishment was at a risk of Indian challenge, and in response Spate recommended education as a reasonable strategy to overcome some if not all of ethnic prejudice in Fiji, but his suggestions were too radical for its time as Indians and indigenous Fijians sought their own separate and untainted cultural representations. A year later in 1960, a report by Alan Burns highlighted deep-seated fears between Fijians and Indians and went further than the Spate report to suggest deportations of some members of the Indian community (Legislative Council Paper No. 1, 1960: 13). It was in the same year that Indian militancy in the sugarcane areas surfaced and permanently fractured Indian relations with Europeans and indigenous Fijians. At the center of the Indian militancy in the sugarcane areas was India-born A.D. Patel who instigated cane harvest boycott (Pacific Review, 11 August 1960). The position of A.D. Patel was strongly criticized by other Indian leaders for his actions including Fiji-born Ayodhya Prasad (India born) and Fiji-born Vijay R. Singh. The problem with the Indian leadership in Fiji was that they were making no attempts to negotiate and liaise with either the Europeans or indigenous Fijian chiefs and both these ethnic groups saw Indian leaders moving tactically to usurp power from the Europeans and then having secret plans to alienate indigenous land. Fiji’s governor remarked that indigenous Fijian be given additional seats in any new Legislative Council so that they could safeguard indigenous interest against the accesses of Indians in the Colony (Legislative Council Paper No 40, 1960: 3). Governor Kenneth Maddock (1958–1963) ensured that ethnic representation was effectively codified in the colonial electoral system with four indigenous Fijians for the first time directly elected with further two members appointed by the Council of Chiefs. Indians elected six members and Europeans six. The tri-modular ethnic representation was in train, but Indian members led by A.D. Patel pushed needlessly for common roll. With Indians now a majority in the colony, A.D. Patel called for “independence” which forced other ethnic communities into defensive strategies. Indigenous Fijians and Europeans embraced the Alliance Party led by Lauan Chief Ratu Sir Kamisese Mara, who professed paramountcy of political interest of indigenous Fijians as a baseline for peace and stability. The argument was that it was indigenous Fijian chiefs who ceded the colony to Great Britain and it was Great Britain that was duty bound to return the colony to the chiefs. Indians were seen as agitators and Indian-born leaders influenced by divisive politics of the Indian subcontinent that witnessed bitter partisan of British Indian and communal riots which killed about a million innocent. Colonial governor, Sir Dereck Jakeway, reiterated that the colonial administration would never allow indigenous population to be placed under the political control of an immigrant community (The Fiji Times, 19 February 1965). In his deliberation, Governor Jakeway reiterated Gordon-Chief viewpoint of protecting indigenous Fijians and continuing with the humanitarian colonial policy toward the natives since the Deed of Cession. Indian leaders were unimpressed and demanded clarity from the colonial administration on decolonization. However, the tri-modular ethnic set up after Cession had deteriorated as members of the European and indigenous communities expressed serious concerns over Indian ambitions and designs. Ethnic tensions had peaked in the colony by 1965, and the leader of the indigenous Fijian-led Alliance Party, Ratu Sir Kamisese Mara, advised that his community did not want independence from Great Britain and efforts to increase the rights of Indians were “doomed to fail” (Sunday Telegraph, 25 July 1965). Fearing further problems, the colonial government held a constitutional conference in London with representatives from all parties, and it was proposed that indigenous Fijians be given 14 seats, Indians 12 seats, and Europeans 10. These allocations of seats were criticized by the Federation Party as creating further communal and ethnic isolation and argued for common electoral roll of one person, one vote. Indigenous Fijians and their European allies responded by suggesting that common roll was equivalent to Indian control of the government and eventual demise of indigenous land rights. With the support of the Council of Chiefs, the colonial government in Fiji enacted a new constitution in 1966 based on the recommendations of the constitutional conference of 1965. The colony held general elections under the constitution, but the political atmosphere was incredibly toxic. Federation participated reluctantly in the election and continued with demands on common roll, independence, and equal rights. Indigenous Fijians were deeply concerned about their political position and land rights, and Europeans saw their position of privilege in jeopardy due to increasing Indian activism. The only sign of hope for both indigenous Fijians and Europeans was divisions among Indians and to some extent differences between India-born (Indians) and Fiji-born Indians (Indo-Fijians). One of the anti-Federation activist was Indo-Fijian Brahma Dass Lachman, who bitterly criticized the Federation Party and called for non-girmitiyas to be placed on work visa. Lachman was particularly incensed by India-born leaders A.D. Patel and Rudranand who were leaders of the Federation Party that advocated equal political rights to all Indians in the colony and immediate independence. However, Lachman argued that indentured laborers who chose to stay in the colony and their descendants were more equal than those Indians who came as free migrants and established small business to compete with Europeans. In a letter to editor to the Fiji Times, Rajendra Prasad of Nasinu opined: “I am afraid to say that some of the Fiji born Indo-Fijians openly played into the hands of the Gujaratis (namely A.D. Patel). Previously, the Gujarati dominated us financially, but now, we are politically dominated too” (The Fiji Times, 14 October 1966). The issue of rights between these two groups, Indo-Fijians and Indians, was never resolved, and on 1 September 1967, a ministerial system of government was introduced by the colonial government. Immediately, the Federation Party took offense and resigned from the Legislative Council. The resignation and the subsequent by-election were seen by indigenous Fijian leaders and Europeans as a political stunt aimed at undermining the 1966 Constitution. To further stir communal emotions, members of the Federation Party increased their votes in the by-elections which were held in 1968. For indigenous Fijians, the Federation Party was unwilling to work with their leaders to understand indigenous concerns and fears. In addition, the resignations of Indian members in 1967 were seen as insulting to the chiefs, especially after the support given by the Council of Chiefs to the constitution. Europeans, while supporting the indigenous Fijian position, were resigned to the fact that Indian tactics had worked and Fiji was heading toward independence. On 9 May 1968, British representative on the United Nations Decolonization Committee, Creighton Burns, remarked that “Fiji was ready for independence. However, indigenous Fijian leaders are understandably more than content to hasten slowly towards independence. They fear that premature independence could precipitate racial conflict and competition with the Indo-Fijian community” (The Age, 9 May 1968). Furthermore, the Federation Party not only pushed for independence, but its leaders wanted an independent republic (Vasil 1972: 25) modeled along the independent India, and furthermore, they also advocated common roll. However, R.K. Vasil (1972: 26) noted that “the fear of the Fijians with the use of the term Fijian to refer to all the people of Fiji” would lead to the loss of Fijian identity. During fieldwork in Nadi in 1993, I made the following observations based on extensive discussions with indigenous Fijians: Indian and Indo-Fijian leaders did not understand indigenous Fijian language and culture, and Indian leaders in particular could not comprehend the emotions associated with indigenous land and above all failed to realize that politics was part and parcel of the larger social discourse associated with the vanua. (Extensive fieldwork was undertaken as part of my post-graduate studies on the question of Fiji’s independence. Village elders and students from Narewa, Namotomoto, Navoci, and Nakavu were interviewed.) Furthermore, many indigenous Fijians believed that independence had been “forced on to the indigenous Fijian people by Federation leaders and the government of India” and that “independence should have been deferred until indigenous Fijians and their leaders are fully inducted in the democratic processes” and Indian and Indo-Fijian leaders become fully conversant with indigenous language and custom. One interviewee opined that “indigenous Fijians should have had at least twenty years” transition to self-rule. Similar sentiments were expressed by my father who studied at Shri Vivekananda High School in Nadi, where future Indo-Fijian leaders of Fiji were cultivated but none of these leaders understood the nuances of indigenous custom, tradition, and aspirations. More importantly perhaps as I have noted was the views of India-born nongirmitiyas and those who were India-born and Fiji-born descendants of girmitiyas. As Robert Norton (1993) emphasized, intra-communal dynamics played as much a part in establishing the “accommodation” paradigm as ethnic tensions as the duality within each ethnic group led to political contradictions that continues to be unresolved. Some indigenous Fijians wanted modernity, whereas some Indo-Fijians silently espoused peaceful coexistence. However, at the national level, both communities compromised their extreme communal positions and artificially provided support for independence. 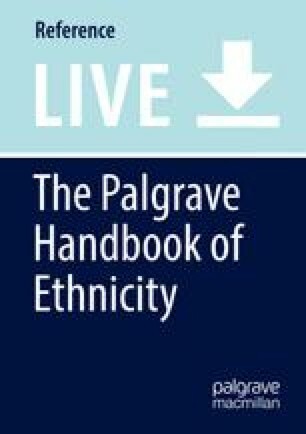 The theme of colonialism playing a central role in ethnic conflict is also discussed by other authors in The Palgrave Handbook of Ethnicity. Jacob Mwathi Mati (2019) analyzes ethnicity and politics in Kenya and in particular how anti-colonial struggles were influenced by inter-ethnic, generational, and class alliances which exploited racial antagonisms to rally African unity against the politically dominant white colonial elite. Morsen Moses (2019) looks at colonialism and race in Vanuatu, and both these authors highlight the destructive role of colonialism in ethnic conflict. A more general theoretical contribution on colonialism is from Vijay Naidu (2019) who conceptualizes colonialization as a form of state-sponsored racism where ethnic divisions are institutionalized in support of European hegemony. The article showed that European contact drastically changed indigenous social relations and brought an influence that led to an alliance between the chiefs and the Europeans. In 1871, a government was established but conflict among communities led to the cession of Fiji to Britain, which established an indigenous administration based on experience of the Kingdom of Bau. Moreover, the colonial administration, under the leadership of Sir Arthur Gordon, introduced into the colony a third racial and cultural category in the form of Indian indentured laborers, who started agitations for political equality after end of indenture in 1920. Seeing the rapid growth and progress of Indians, colonial governors, after Gordon, tried without success to introduce indigenous Fijians to commerce. Concerned about the pressures on indigenous Fijians and on indigenous land, Bauan Chief Ratu Sukuna assisted in the formulation and the implementation of the NLTB. In colonial Fiji, indigenous chiefs were increasingly driven by concerns of further indigenous land alienation, introduction of indigenous Fijians to wage labor, and the presence of Indians in the colony. As a result, the chiefs continually reinforced Governor Gordon’s viewpoint of protecting indigenous custom and tradition. Conflicting and often oppositional views between Indians and Indo-Fijians and indigenous Fijians and their chiefs came head on in the 1960s as Britain formed the opinion on independence of the colony. The Indian- and Indo-Fijian-led Federation Party argued for common roll electoral system, Fijian as a common name and a republic, whereas indigenous leaders called for protection of indigenous political interest, land, and leadership and emphasized continued relationship with the British crown. The historical ethnic tensions, which were managed by the British colonial administration, surfaced to the forefront in the 1960s to create a problematic inter-ethnic social discourse that remains irreconcilable even to this day. Other authors in this volume including Jacob Mwathi Mati, Morsen Moses, and Vijay Naidu use similar themes of analyses to demonstrate the role of ethnicity and race in intergroup conflict and tensions during colonial rule in Kenya, Vanuatu, and Fiji.